Heat oven to 350°F (325°F for dark or nonstick pans). Make, bake and cool cake mix as directed on box for 24 cupcakes. By slowly spinning end of round handle of wooden spoon back and forth, make deep, 3/4-inch-wide indentation in center of top of each cupcake, not quite to bottom (wiggle end of spoon in cupcake to make opening large enough). Spoon lemon curd into corner of resealable heavy-duty food-storage plastic bag. Cut about 1/4 inch off corner of bag. Gently push cut corner of bag into center of cupcake. 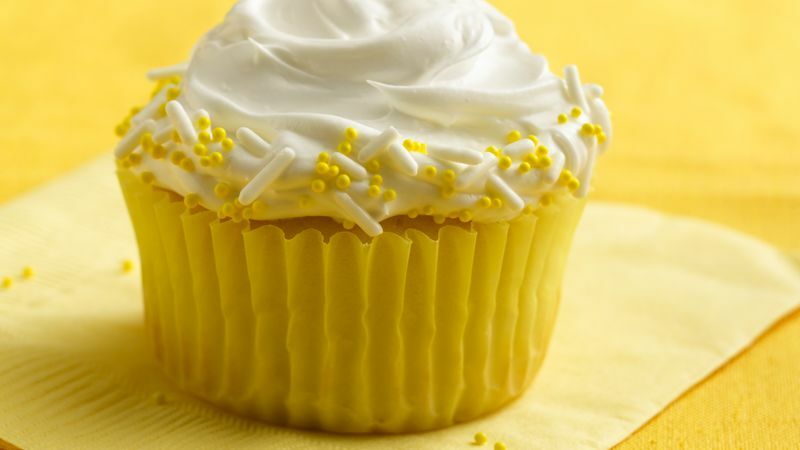 Squeeze about 2 teaspoons lemon curd into center of each cupcake for filling, being careful not to split cupcake. Frost cupcakes with frosting. To decorate, roll edge of each cupcake in candy sprinkles. Store loosely covered. If you have only one 12-cup muffin pan, cover and refrigerate the rest of the batter while baking the first batch. Then bake the rest of the batter in the cooled muffin pan, adding 1 or 2 minutes to the bake time. Planning a wedding reception? Make your own cupcakes!